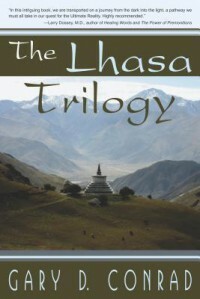 The Lhasa Trilogy by Gary D. Conrad is a mesmerizing book. I gave it five stars because it kept my full attention from start to finish. It crosses continents and generations. It shows evidence of extensive research. Reading this author's writing is like inhaling a satisfying breath of fresh air. Upon reading the scene where there is a pending birth and the father is waiting for a doctor, the tension was palpable. When I read certain scenes from battles in Iwo Jima I felt as if I were there. Matt was "a man on a mission, a well-trained fighting machine--and this, coupled with his innate country good sense and seething anger, made for a deadly combination." I responded to the descriptions of war with horror and grief. After Matt's best friend, Joe was killed Matt suffered. "Depression was something he previously had only heard about. It was a midnight feeling that clawed its way into his gut and played games with his mind. When he was sure no one was watching, he lay on the ground, pulled his knees into his chest and quietly rocked back and forth. The fetal position somehow soothed his frayed nerves." After much travel and a full life, Matt passed from this existence but continued to learn. Matt experienced a sense of relief. Abraham continued. “Karma, though, is created with each and every act, and at some point in time you have to face the effects of what you have created. But karma is not about punishment, it’s about learning." The Lama Tenzin Tashi agreed to work with Matthew to help rectify his karma. It was a lifelong commitment that took great time and effort.